The IACHR report on police violence draws on information received from several sources, including the hearings that the IACHR has held on the issue held between 2014 and 2017; the press releases that have monitored the situation in the U.S.; an onsite visits to Florida, Louisiana, and Missouri; and submissions issued by both State and non-State actors on the matter. See id. at para. 17. The relevant hearings include one on excessive use of force by police [video link], criminal justice and race in the U.S. [video link], racism in the justice system of the U.S. [video link], discriminatory impact of “stand your ground” laws [video link]. The new report finds that racial discrepancies within the U.S. criminal justice system are widespread. The report identifies multiple problematic practices that apply across the U.S., such as over-policing and racial profiling; the militarization of police forces; police use of excessive force; impunity in cases of police killings; police responses to protests; racial disparities in criminal arrests, convictions, and sentencing; and the lifelong consequences of prior incarceration and felony convictions. See id. at para. 4. The IACHR concludes that certain policing policies, such as “stop and frisk” (a policing tactic that involves stopping people on the street and patting them down to search for weapons) and “Broken Windows” (a theory of policing that heavily criminalizes small offenses and crimes of poverty) disproportionately target minority populations in the U.S., despite the fact that these tactics have been proven ineffective in preventing criminal activity. See id. at paras. 66, 78, 81. The IACHR also finds that police forces in the U.S. are increasingly acquiring and deploying military-style equipment. See id. at para. 88. The IACHR observes that police often use this equipment against historically marginalized groups, citing an American Civil Liberties Union study finding that 42 percent of people affected by SWAT (Special Weapons and Tactics) deployments were African American and 12 percent were Latino. See id. The report raises concerns over the government’s failure to collect official data on police violence and killings, questioning the government’s duty to exercise due diligence. See id. at para. 92. 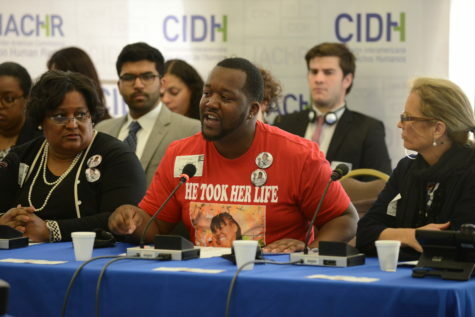 While the U.S. does not maintain a federal database to track police violence and killings, the IACHR highlights that based on available information, U.S. police kill approximately 1,000 people per year, and wound 50, 000 people per year on average. See id. In 2017, the IACHR notes that 300 of the 987 people killed by police, more than 300 were fleeing from the officers who shot and killed them. See id. The IACHR finds that despite making up only 13 percent of the U.S. population, African Americans made up 23 percent of victims of police killings in 2017, 24 percent of killings in 2016, and 26 percent in 2015. See id. at para. 93. Additionally, the IACHR finds that police officers often kill with impunity, for example the IACHR cites to one study that looked at thousands of police killings between 2005 and 2015 and discovered that only 54 police officers were even charged with a crime, and of those charged, most were cleared or acquitted. See id. at para. 105. The report analyzes how this discrimination implicates the U.S.’s international obligations to ensure equality; to abide by the principles of legality, necessity, and proportionality; to protect the right to life; to ensure access to justice and effective remedies; and to safeguard protesters’ rights. See id. at para. 6. The IACHR notes that the U.S. has an obligation to guarantee the human rights to equality and non-discrimination under Article II of the American Declaration on the Rights and Duties of Man, and reiterates that the Inter-American Court has considered these rights jus cogens norms. See id. at paras. 187, 191. The IACHR reaffirms its understanding that these norms prohibit both direct and indirect racial discrimination, and that laws with a discriminatory effect or “disparate impact” violate these rights. See id. at paras. 193, 197-98. While the U.S. legal framework protects against racial discrimination on paper, the report concludes that it largely fails to prohibit discriminatory effects of seemingly neutral laws. See id. at para. 196. Moreover, the IACHR finds that U.S. policing practices, such as the “Stop and Frisk” programs, disproportionately effect individuals on the basis of their race, ethnicity, and national origin. See id. at para. 199. The IACHR observes that these practices are “presumptively incompatible with the American Declaration as a form of racial discrimination,” and may amount to inhumane or degrading treatment under international law. See id. The IACHR also analyzes the State’s obligations to protect the right to life under Article I of the American Declaration. See id. at para. 201. The IACHR observes that the right to life applies to State action at all levels of government, including federal, state, and local police. See id. at para. 209. Accordingly, all uses of police force must conform with the international right to life standards, namely that any lethal use of force must be absolutely necessary, proportional to the interest served, and provided for under the law. See id. at para. 202. The IACHR finds that under international law, the use of lethal force by law enforcement is only legitimate when used “to save the life of a person or to protect a person from serious injury.” See id. at para. 208. With respect to the U.S., the IACHR finds that domestic laws, at both federal and state levels, fail to establish different standards for lethal and non-lethal uses of force, which puts the U.S. out of line with international standards. See id. at paras. 211-12. The IACHR also finds that the trend towards militarizing police, in terms of military style equipment and tactics, violates the principle of proportionality under the right to life. See id. at para. 238. These same principles apply to the use of force in the context of social protests, which the U.S. often uses as a means to contain or repress public demonstrations. See id. at para. 239. The IACHR emphasizes the State’s responsibility to guarantee the right to protest for demonstrators, and to ensure protections for journalists and the media reporting on protests. See id. at paras. 239, 246. Lastly, the report examines the State’s duty to act with due diligence, which includes a responsibility to prevent, investigate, punish, and provide reparations for potential police abuses under articles XVIII and XXIV of the American Declaration. See id. at paras. 251, 281. Additionally, the IACHR adds that access to justice requires that the U.S. establish “adequate, effective, and accessible” legal remedies for police violence and that it ensures reparations for victims. See id. at para. 184. The IACHR finds that the significant number of incidents of police violence against African Americans that end without convictions, particularly where the victim was unarmed, amounts to a systematic failure on the part of the U.S. to ensure adequate investigation and prosecution of police abuses. See id. at paras. 276-78. The IACHR concludes that reform of police practices and institutions is required to bring the U.S. in line with its international obligations. See id. at para. 10. The IACHR makes 33 recommendations to assist in ensure international standards are respected in the U.S. See id. at 157-64. The recommendations include conducting official studies on the extent of violations, ensuring adequate reparations for victims, creating independent oversight departments at state and local levels to receive complaints of violations, reforming domestic legislation to conform with international standards, creating a federal database of police use of force, and ensuring that incidents of police killing are investigated and prosecuted according to international standards. See id. The IACHR’s last thematic report on the U.S., released in September 2018, addressed human rights issues related to the U.S. prosecution and incarceration of children, many of whom are tried and sentenced as adults. See IACHR, The Situation of Children in the Adult Criminal Justice System in the United States (2018). The September 2018 report exposed the disproportionate representation of minority ethnic and racial groups, particularly African American and Hispanic youth, in the criminal justice system. See id. For more information on that report, see IJRC’s coverage. The Inter-American Commission addresses human rights conditions and violations in the 35 Member States of the Organization of American States (OAS). Established by an OAS resolution in 1959, the IACHR began operating in 1960, observing human rights conditions via on-site visits, and in 1965 was authorized to begin processing specific complaints of human rights violations. OAS Member States recognized the IACHR as the region’s principal human rights body through a protocol to the OAS Charter which was adopted in 1967 and entered into force in 1970. For more information on the Inter-American Commission on Human Rights, visit IJRC’s Online Resource Hub. For an overview of the United States’ human rights obligations, see our two-page country factsheet. To stay up-to-date on international human rights news, visit IJRC’s News Room or subscribe to the IJRC Daily.